Dan joined Amy Robach for another episode of GMA LIVE! on Wednesday, April 30th. The first guest who joins the duo, does so via Skype. 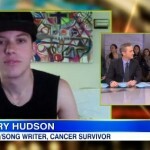 Harry Hudson, a 20 year aspiring musician, who just weeks after releasing his first single was diagnosed with cancer. After going through months and months of treatment, doctors have pronounced Hudson cancer free and he just released a new music video for his inspiring song “Learn to Love”. The song is available on iTunes and all proceeds benefit the American Cancer Society. Following their Skype conversation with Harry Hudson, Amy and Dan are joined by two boys who have become superstars through the mobile application “Vine”. 16- year old Nash Grier and 18- year old Cameron Dallas have a combined following of over 11 million on the video application and announced they will be partnering with AwesomenessTV for an upcoming film. Watch the full episode from 4/30/14 here.